Life gets in the way of eating, sometimes. I am at the hospital, working the weekend shift again. At least it's not the night shift anymore, for now. It is completely overwhelming, starting out here. All the studying, all the "practice" and "labs" did not prepare me for this at all. For the 12 hours I am here, I am trapped in work. And if it is very busy, I am so hungry. Take today. This morning I ate three Mr. Goodbar minis from the staff candy jar, which according to my feeble justification is actually a passable breakfast. Protein from the peanuts, carbs and caffeine from the chocolate. I also drank a lot of bad coffee. That was many hours ago. When I dropped my patient's open IV bag (panic panic panic) and dashed off to get help, one brief (panicked) thought was, "Can I get an IV of food too?" Later I looked at the liquid diet solution and shuddered. It looks and smells brutal. No, I don't care for things like Slimfast or Ensure. I should have stayed in school. Perhaps in a few years, when I am free again. I have learned my lesson. Everything I eat during the week is alone-food. There was the hardboiled egg at 4:30 this morning before heading to the hospital for first shift, peeled and eaten over the sink with an old piece of wheat bread and lukewarm coffee. Later, probably leftover rice, boxed mac and cheese. Toast? Who knows. I don't know if it has to be this way, but at the same time I like it. Creatures of routine and all that. There's a new exboyfriend in my phone book and an old "on again off again" boyfriend with whom my weekends are spent, forgetting the hermit-like habits of the work week. He's been talking about moving in together, and my life would change. Even on working days there would be foods to eat together and not in private - taco cart tamales, intimate sushi dinners, shave ice on a hot day in Balboa Park. Sometimes I think, that would be nice. It'd be nice to have him around again, to settle into the routine of "us" and not "me." And yet sometimes I think of how all I want is Shin Ramen from the microwave, or to sleep alone again. mango juice, teriyaki sauce, Tapatio hot sauce, butter and leftover duck curry. I have to use these things. In bold are things I need to use or eat ASAP. So basically I'm cooking for one in a tiny living space that I'm technically not supposed to be cooking in. No oven or stove. I have learned how to make pretty good food using just a microwave, contraband rice cooker and toaster oven. Today, I'm eating teriyaki chicken over spinach and rice with a microwave-made poached egg. Tried to take a photo but it's just unappealing looking. Need to learn how to make attractive single girl food, apparently. Pre-post tangent: I want to start writing again. Something with a more focused subject like food seems easiest to start out with, so I'm back here. So, hi, I'm back. I've already been to the Little Italy farmers market and this morning, finally got around to checking out the Hillcrest market with my dearest yunoa this morning. Concise description: it was great. More details soon, i.e. NOT the day before I begin working the night shift rotation at the hospital. Aside from those two markets, current boy has expressed interest in accompanying me to the Wednesday market in his area. All of my plants got eaten by snails / slugs this year, including my (eight) beloved eggplants. It's hard to motivate myself to plant more because it feels like, what's the point? 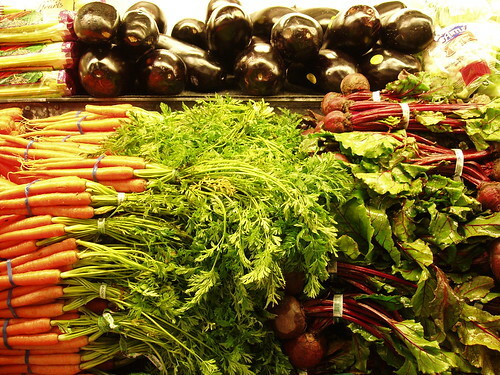 Unfortunately, I refuse to use poison or pesticides, because I don't want that near my vegetables, so it seems like I'm just paying to feed the snails and slugs. This is just a reminder to myself not to give up, and to plant more things in pots away from snail / slug territory. 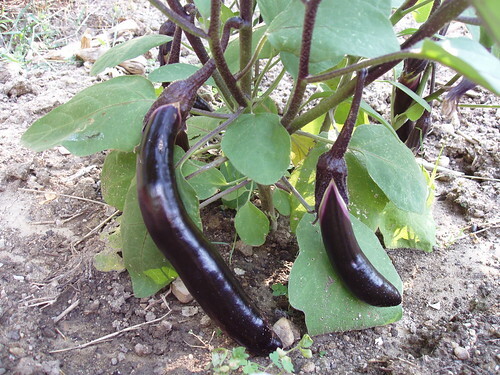 The payoff will be worth it; I'll have eggplant to use in these recipes. Right? Wish me luck in my battle against the snails and slugs. mspaintfail, originally uploaded by jangkaeng. Asparagus, sausage, tomato sauce and mozzarella on pizza. Dried thyme, parsley, oregano (or prepacked Italian seasoning). For me, a sprinkling of red pepper flakes before consumption. SO GOOD. At first it was questionable. "Asparagus..? On pizza? hm. Well, Wolfgang Puck did it." If it's good enough for WP, it's good enough for me. So I did it. THANK GOODNESS for Wolfgang Puck, and his really hot wife for the sole reason that she's really hot. WP helped me conceptualize the pizza, and the hotness of his wife reminded me that one can not eat five slices and still attain a hotness at least somewhat comparable to hers. Hooray. The boy has a weakness for pie. I have a love of baking and cooking. Nice how that worked out, huh? 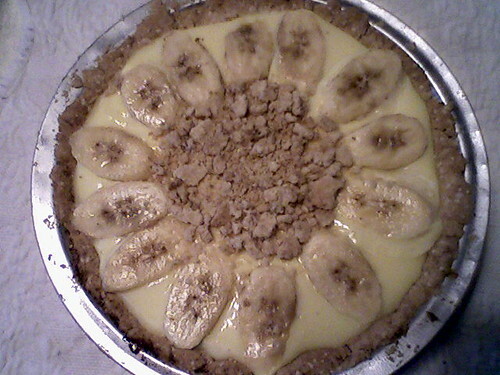 This was my attempt to impress on our first Valentine's Day together: banana cream pie. I was unhappily surprised to find that so many recipes for the filling had cornstarch as an ingredient. I have nothing against cornstarch; it was just unexpected. I'd always thought that the filling would be a custard instead of a pudding (milk thickened with eggs vs. thickened with starch). P.S. Lest you think it was all fun and games we tried to make Rice Krispie treats as a fun activity (we're lame like that) and FAILED. How does one f*** up Rice Krispie treats?! We didn't even drink that much wine! Sadly, they (it, as it is all one massive disaster) are hard, overly crunchy and more than a little bit scary. I'm still eating them though, because I am marshmallow obsessed. Tagline: "Where dreams become heart attacks." Quite possibly the most amazing site EVER. It showcases ridiculous feats of food such as corn dog pizzas, burgers with 10 patties, deep fried Coca Cola (wtf) and other tributes to excess. Beautiful. There is a breakfast burrito (one of my top 5 food weaknesses) that weighs SEVEN POUNDS in the archives. I feel the need to go for another three mile run today after reading this. The first one was not enough to burn the calories gained from merely looking at the photos. Maybe this is what love feels like. Or heartburn. yeah, that too. Go take a look and be amazed. There is nothing as ugly and difficult to photograph as a good, messy, faux-unhealthy burrito. - Lettuce, tomato, cilantro. I don't like raw onions :( but you can have them if you want to. The beans are key. So easy and so AMAZING. I'm in love with my little green slow cooker. 1. Wash rice until water runs somewhat clear. It'll be translucent but light. 2. Add 2 cups rice and 2 cups water to rice cooker. Basically, 2 cups of rice. I always use a 1:1 rice to water ratio. (This can be done on the stovetop according to your ratios, but I have no idea how to do this without burning my rice). 3. Add 1/2 cup tomato sauce to the rice for 2 cups. 4. Optional: add chicken seasoning and cilantro to rice. 5. Cook per your rice cooker instructions. Assemble burrito ingredients as desired on tortilla. Try not to put too much filling, otherwise your burrito will explode like James Bond's pen gun in Never Say Never Again. Currently looking for the perfect recipe. Also considering the most important aspect: Kahlua vs. Starbucks coffee liqueur. These are my two favorites.